It is not supposed that Raphael would know Homer and Virgil and Horace and Pindar and Sappho at first hand. However, he did have friends among the learned men who could tell him of the treasures of classic literature and his imagination was quick to seize this material and adapt it to artistic purposes. The Parnassus is one of the four frescos Raphael painted on each of the interior walls of the Stanza della Segnatura in the Vatican Palace. 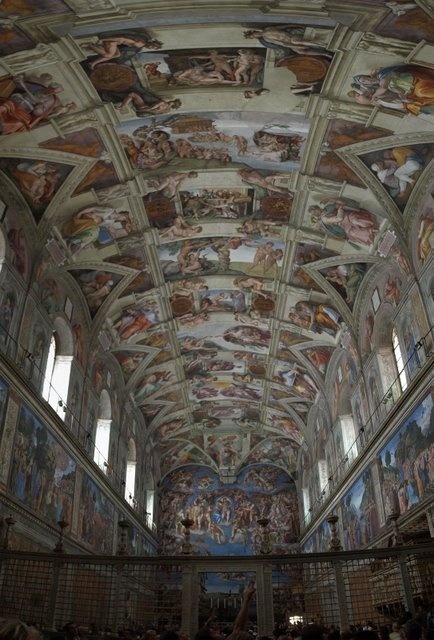 It was the third fresco that Raphael created between 1510 and 1511 AD for the art patron Pope Julius II. Raphael chose Mount Parnassus as the setting for his painting, most probably because Delphi (the shrine of the God Apollo, ruler of music, poetry and fine arts) resided upon its slopes. Apollo is also the focal point of this painting. 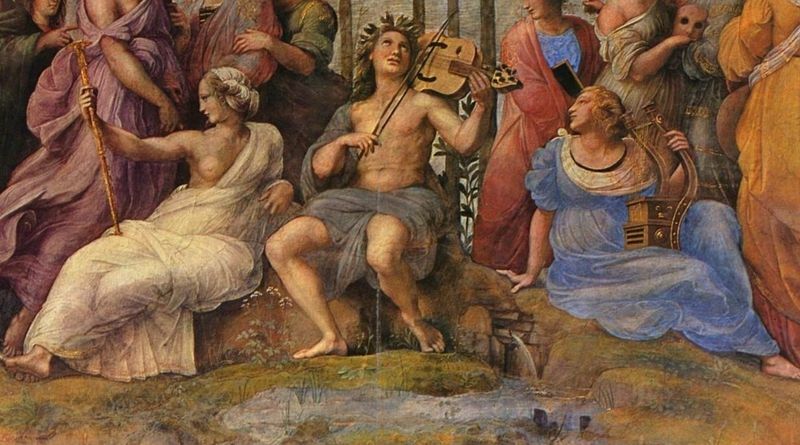 He is sitting under a laurel tree playing a lira da braccio (an instrument of the Renaissance's time), while surrounded by the nine Muses and various renowned poets. 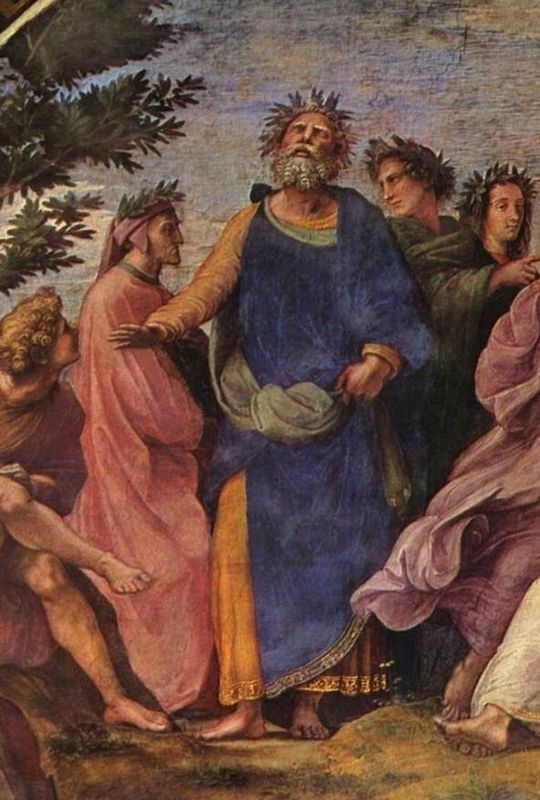 The poets vary from pre-classical antiquity to the modernity of Raphael's time include: Homer, Alcaeus, Sappho, Anacreon, Virgil, Horace, and Ovid to Dante, Boccaccio, Ariost, and Petrarch. That antiquity and modernity are represented symbolizes the timelessness of poetic art. By gender, there are 10 females, the nine Muses plus the Greek poet Sappho, and 18 males, the god Apollo and 17 male poets. Historians have only been able to identify only about 12 of the 18 poets. Five of the figures possess musical instruments. 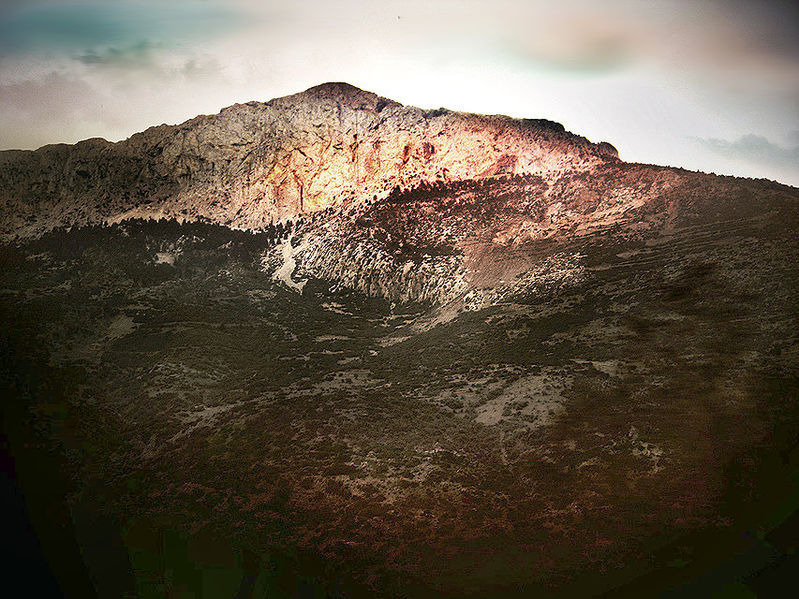 Mount Parnassus according to ancient Greek myth was the mountain on which the Muses often met and Apollo had his chief seat. Here, as per the fancy of the ancients, the poets, historians and dramatists came to draw inspiration. Raphael's The Parnassus has made a great company of gods and goddesses, and ancient and modern poets through an imaginary scene. In this mythic realm, time and space are as nothing and the poets are united in the higher fellowship of the inspired imagination. 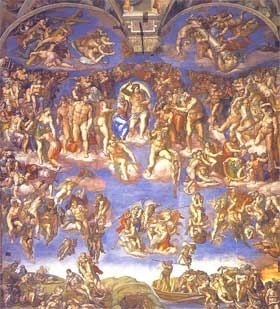 The Parnassus was among the first great paintings which Raphael executed in the Vatican, and the grace and harmony which mark his later works are here shown. The painting is also as another illustration of the great revival of learning which took place in Raphael's day. The old literature of Greece and Rome had been rediscovered after being forgotten under the ignorance and the fighting of the Middle Ages. It was brought to light through paintings like Raphael's, who as an artist took delight in the statues which had been found and the other signs of Greek and Roman art. The Stanza della Segnatura (Signature Room) was used for much of its history as a meeting room for the Tribunal of the Curia. However, in 1958 it was deemed that the room should become the Pope's personal library. As a result, Pope Julius II decided that the room should be decorated to honor past officers and followers of the Church. To perform this work he commissioned Raphael (then working in Florence) with the task of covering the walls and ceiling with frescoes. The Parnassus brings into harmony the spirits of Antiquity and Christianity of the poetic arts. The overall theme of the Stanza (decorated by Raphael practically by himself) is worldly and spiritual wisdom, along with the harmony which Renaissance humanists perceived between Christian teaching and Ancient Greek philosophy. 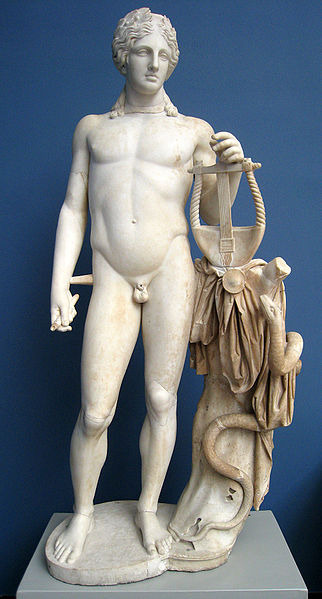 Apollo statue, Circa 150 AD. The Parnassus is a large fresco measuring 670 cm wide at the base. It was Raphael's third major composition for the Stanza Della Segnatura and depicts the theme of poetry. It is located directly adjacent to the School of Athens. The Parnassus frames a view of Mons Vaticanus, enclosed by Bramante's Belvedere. In the painting Apollo sits upon Mount Parnassus, his head raised upright in acknowledgement of his gift surrounded by the nine Muses. He is also together with the great poets of antiquity along with Dante, Petrarch and Boccaccio. Raphael drew upon an unprecedented range of classical sculpture and musical instruments for his frieze-like composition. This is with the exception of Apollo's lira da braccio, which was a modern instrument of the Renaissance. Furthermore, Apollo's lira da braccio has been customized by Raphael with two extra stings to bring the total number to nine, the same amount as the Muses, and thus symbolizing harmony. The poses of the figures and the drapery used were adapted from statues. For example, the seated Apollo is an adaptation of a statue from the Grimani collection. 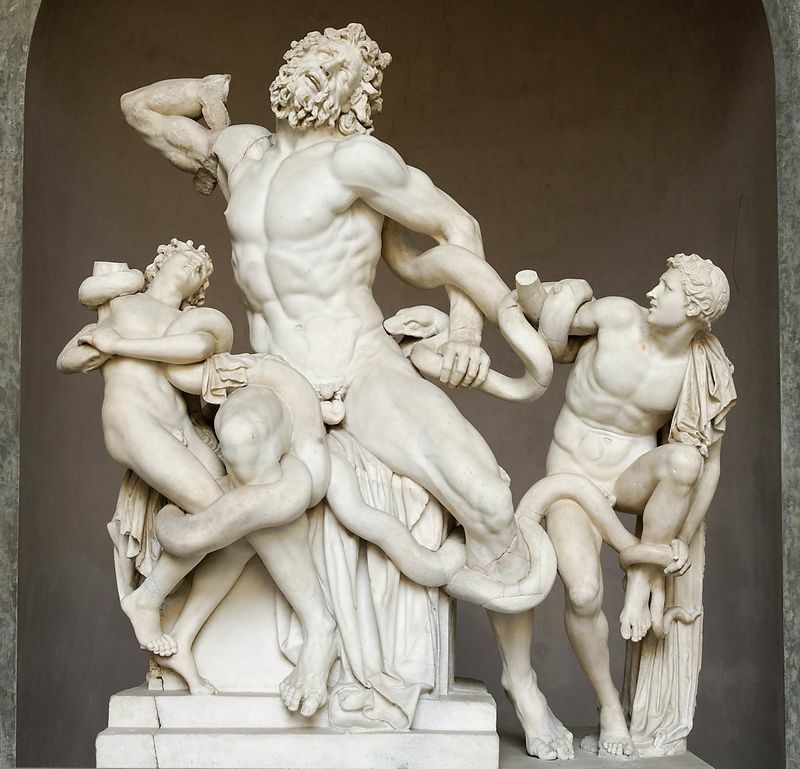 The heads of the Muses and Homer were similarly copied from the now recently discovered Laocoon. In The Parnassus the nearly unbroken linkage of Apollo to the Muses and poets is a reworking of the relief composition of the Roman sarcophagi, not found in the early stages of the design, which is known only by recovered drawings by Raphael and engravings form Raimondi. The classical inspiration was combined with concern to reduce the intrusive window, making it impossible for the spectator to figure out the relationships occurring at the side of the windows to the main field above. He covered the edge of the window on the left with a mountain, and Sappho's arms and lyre. In the painting she therefore becomes a part of the group of poets standing behind the frame and the window. This ambiguity extends to the relationship of the foreground groups to the relationship with the Muses on Mount Parnassus. The poet at the furthest right of the picture appears to be closer to the viewer than Apollo, but in fact, both have the same relationship to the frame. This means that there is a comparable position in space which reduces the depth of the composition. Raphael changed the details of the fresco in several successive sketches. 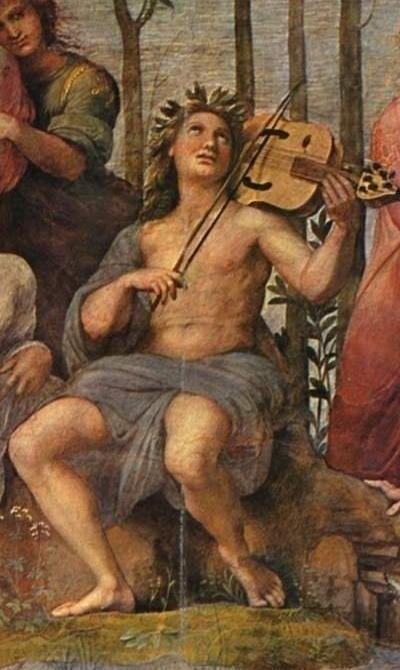 For example, in earlier versions of The Parnassus Apollo played a traditional classical lyre, but the fresco has him playing lira da braccio with a bow. In this fresco, music fills the role of moving force behind the Apollo's universe, at the same time being a symbol of poetry. Raphael's nearly perfect sense of color is legendary. His mural painting technique included the use of permanent lime proof pigments, dispersed in water, which were painted on freshly laid lime plaster. However, The Parnassus is not revered solely for its use of color, more so the overall poetic beauty. The lighting is very logical and consistent with reality and has been used to reduce and add depth to the composition. Compositional harmony and visual counterpoint characterize The Parnassus. The groups of figures are bound together by continuous lines and the single characters are represented in opposite corresponding poses. Although The Parnassus does not contain the same amount of originality as his School of Athens it demonstrates his illustrative ability. Classical elements are included in the piece which would have held great popular appeal for a class excited by archaeological discoveries. Raphael therefore demonstrates his capacity to interpret contemporary taste to his genuine artistic skills. 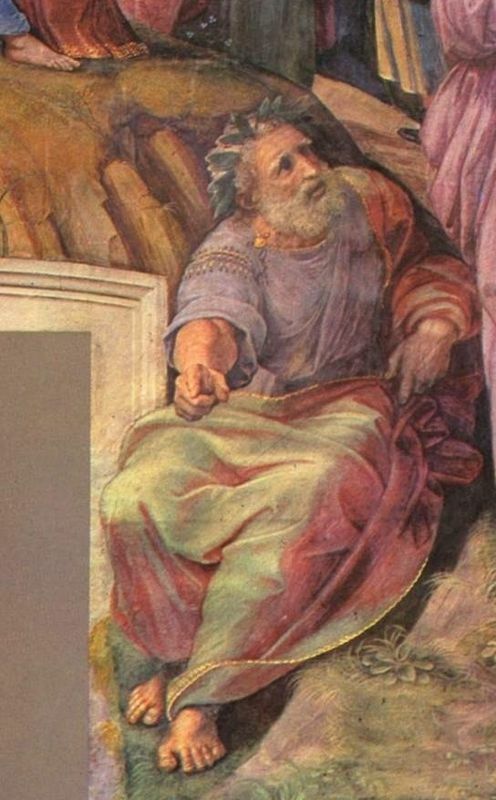 Raphael's brushstroke included the use of Secco (the technique of painting a mural on dried lime plaster or retouching a fresco after it was hardened) and Intonaco (putting the final coat of plaster on the fresco while it is still wet) techniques. Unlike other monumental works of that era (the Sistine Chapel for example) The Parnassus's unveiling and critical reception was not spoiled by any reservations concerning its content. One can ascertain that Raphael's work was well received because of the greatly expanded artistic responsibilities he was given after the artwork's completion. Before Raphael's frescoes in the Stanza della Segnatura were complete in 1514, he was already one of the most celebrated painters in Europe. The Parnassus was seen as just one example of his genius among the backdrop of works such as the School of Athens. Whilst not as critically acclaimed as this latter piece The Parnassus has always been viewed as one of the more sublime examples of High Renaissance art. "... On the wall towards the Belvedere, containing the Mount Parnassus and Fountain of Helicon, he made a shady laurel grove about the mount... The poets scattered about the mountain are remarkable in this respect, some standing and some writing, others talking, and others singing or conversing in groups of four or six according to the disposition. Here are portraits of all the most famous poets, both ancient and modern, taken partly from statues, partly from medals, and many form old pictures, while others were living. Here we see Ovid, Virgil, Ennius, Tibullus, Catullus, Propertius and Homer, holding up his blind head and singing verses, while at his feet is one writing. Here in a group are the nine Muses, with Apollo, breathing realities of delicate Petrarca, and amorous Boccacio, all full of life; Tibaldeo is there also, and numerous other moderns, the whole scene being done with exquisite grace and finished with care. " Raphael's artworks have always been held in the highest regard by fellow painters and critics alike. Whilst The Parnassus has endured less success than the works of Michelangelo or Leonardo da Vinci or indeed his other works such as The School of Athens and the Sistine Madonna, it remains a classic piece of High Renaissance art and an integral part of his overall genius being studied ever since its creation in 1511 into the 21st century. From the time of Raimondi no artist's works have been as frequently engraved as those of Raphael. There is an enormous collection of copper plates in the Regia of Rome depicting his pictures from engravers during the 18th and 19th centuries. Electrotypes of the copper plates are still worked and books of the engravings and photos of his work are still published. The Malcolm, Oxford, British Museum, Lille, Louvre, Dresden and other collections of Raphael's works have been published and many illustrated monographs still exist. 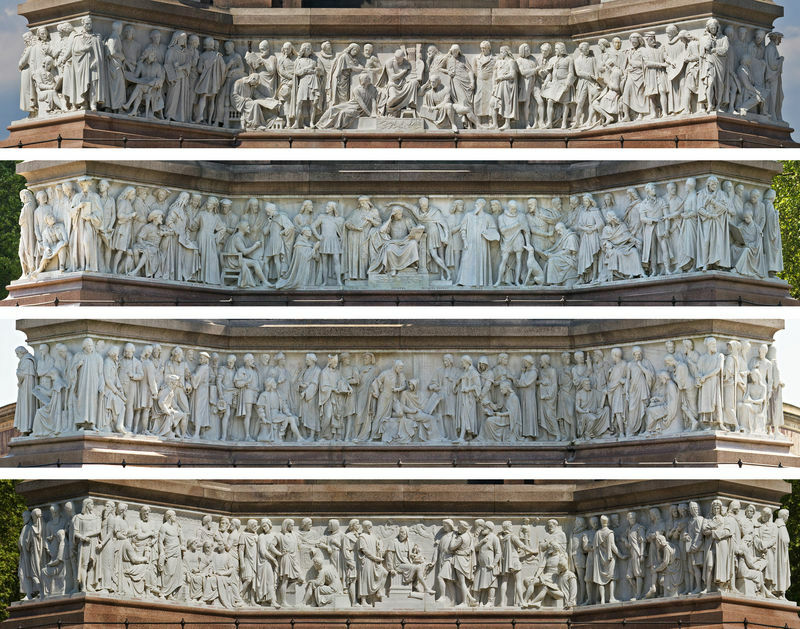 The Frieze of Parnassus is a large sculpted stone frieze circling the podium of the Albert Memorial in London, England. The Memorial was constructed in the 1860s in memory of Prince Albert, the husband of Queen Victoria. Like Raphael's original work, The Frieze of Parnassus is named after Mount Parnassus, the favorite resting place for the Greek muses, and contains 169 life-size full-length sculptures of individual composers, architects, poets, painters and sculptors from history. Raphael's version of The Parnassus is an earlier group portrait of the great artists that has been expanded on for The Frieze of Parnassus. 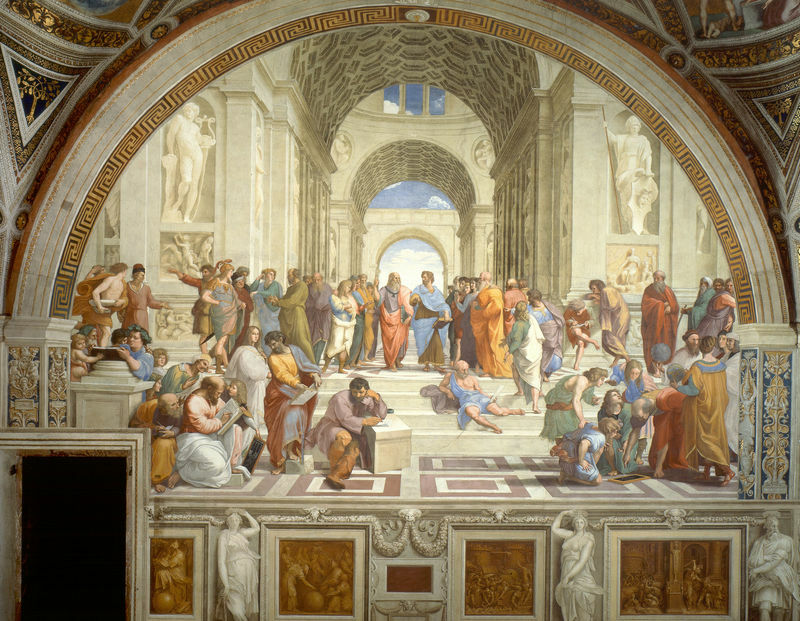 The School of Athens remains in the room where it was painted and can still be visited today. Raphael was only 25 years old when he was summoned to adorn a room in the Vatican palace, and he made the four walls answer to four divisions in the ceiling. The four divisions in the ceiling were filled with four figures, representing Theology, Poetry, Philosophy and Justice. Beneath Poetry was this large, full design of Parnassus. 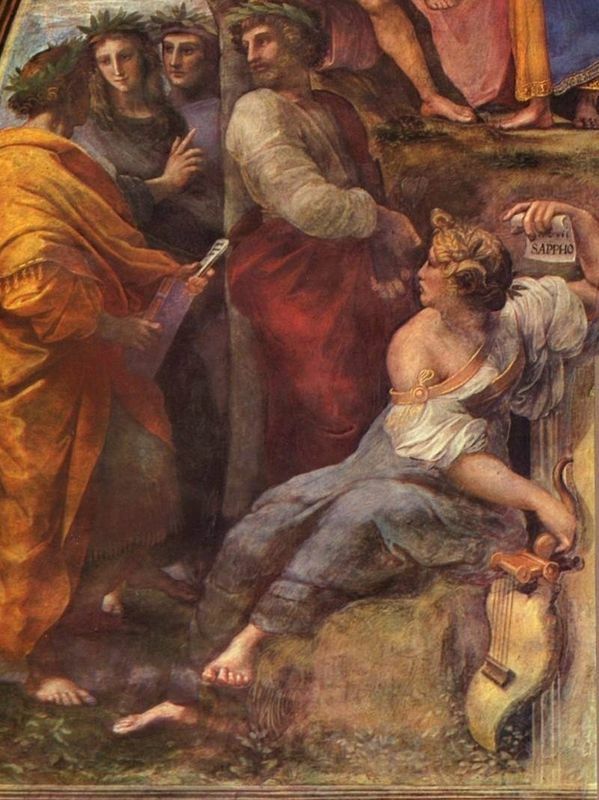 Of the four frescoes that Raphael painted in the Stanza, the Parnassus was completed after the School of Athens and The Disputation of the Holy Sacrament. His reworking of some of the ancient instruments into modern ones, does not signify an ignorance of the classical world with what he was trying to depict, but an active attempt to try and engage with the popular audience. Whether this was part of his need for approval, fame or artistic theory is unknown. Raphael painted during the glory years of the High Renaissance, a period of art during the Italian Renaissance between 1450 and 1527. 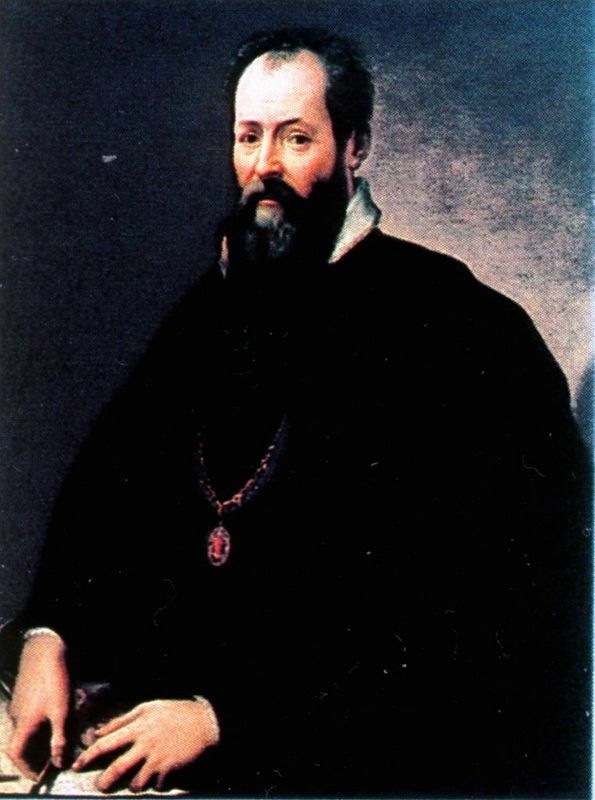 Pope Julius II patronized many artists during this time and through his patronage the movement moved into Rome, after previously being centered in Florence. The Parnassus was completely in keeping with the High Renaissance period. The fact that the depiction of Apollo and his muses, along with the other figures was based on recently recovered statues from antiquity completely confirms the view that the humanist intellectuals and artists were drawing on Classic times as a source for inspiration. The Parnassus's unveiling was during the era that Michelangelo was finishing his brilliant work in the Sistine Chapel, and no doubt Raphael would have felt the pressure to deliver something special in line with their competitive professional relationship.